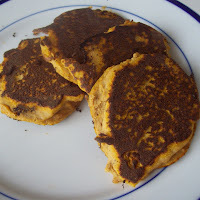 Squash pancakes are a favorite in this house. We top them with yogurt now that we're tolerating dairy (see my guest post at Cheeseslave's blog: How GAPS is Helping Our Family). If you're not on GAPS, squash pancakes are still good. A little more crumbly than wheat pancakes, but you could always add some wheat flour to help them hold together. Because they contain carb/veggie (squash), fat (coconut oil), and protein (eggs), this is an easy all-in-one meal. 3/4 cup of pulp from juicing or cooked squash. I cut the seeds out of apples before I juice them so I can do this. 2 tablespoons coconut oil + more as needed for frying. *Optional: Honey, 1-2 tablespoons. My kids don't care about the honey, so I leave it out. 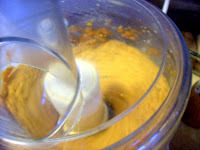 I whir it through my food processor because my juicer leaves big chunks. If you have a better juicer you could mix it in a bowl with a fork. I start the pan on medium heat and then turn it down to med-low after flipping. Smaller pancakes work better than big ones. I think it's amusing if I have green pulp from juicing; we have green pancakes. My kids love these, especially my 3-year-old. 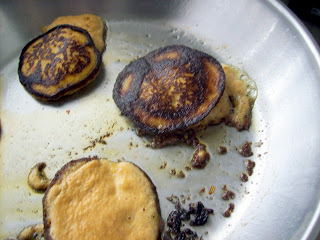 0 Response to "Squash Pancakes"